Trailhead and parking area are on Rt. 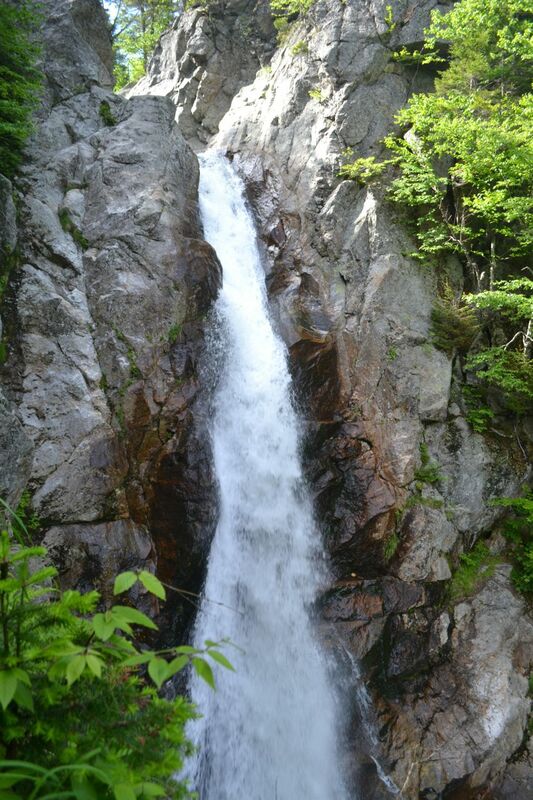 16 in Pinkham Grant, NH (the waterfall is in Jackson), 11.0 miles north of Rt. 302 and 0.8 miles south of Wildcat Mountain Ski Area. The parking area is on the west side of the road. Access the path by walking through the underpass. Glen Ellis is one of the prettiest and most easily accessible waterfalls in the state. Located just 0.3 miles down a gravel and stone walkway, there will almost always be a few other visitors when you arrive, but don't let that deter you from going to see this lovely waterfall. You can get very close to the roaring water and feel the mist from the viewing area. Glen Ellis is a tall narrow plunge through a rock shaft that tilts slightly left as the water pours through. It makes a great side trip for anyone driving through the area.